Chalk this kid-friendly abode up to the power of love. Built as an extension to a lakeside villa in southern Stockholm, Hill Hut was commissioned by the homeowner after he met his new wife and her two children half a world away in Thailand. Instead of setting the kids apart from their picturesque surroundings, the designers at Visiondivision decided to use landscaping techniques to make nature a vital part of the building. 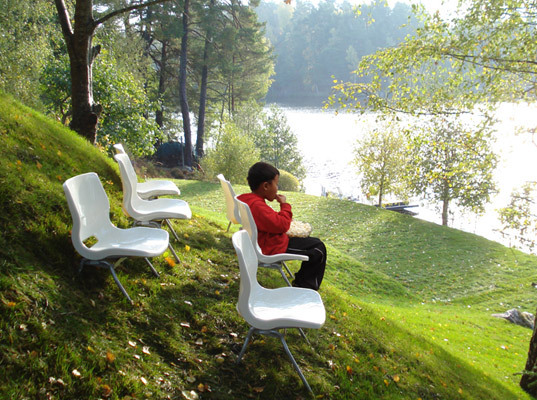 To create a steady foundation for the new addition, huge piles of earth had to be dug up to form an artificial hill, which the designers embellished with an outdoor cinema (the speakers are disguised birdhouses! ), and a slope for sledding. A carpet of artificial grass in the living room, meanwhile, seamlessly paves the way to natural grass on the hill through two large glass doors. 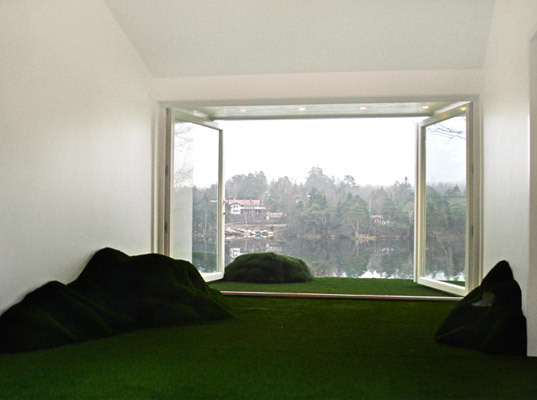 A custom-made grass sofa and a couple of grassy knolls that function as lighting, also add to the organic feel of the home. Perhaps one of the coolest features of Hill Hut are the two secret caves, made from concrete, that hide beneath hatches in the floor of the children’s room. One cave leads to a lush grass knoll by the lake, while the other directs little explorers to a patch of forest. Jealous? Yeah, you and us both.